Amazing. Dark, Stormy Beats Matching Perfectly w/the Dark, Stormy Back to Back Verses by these 2 Talented MC's. El-P has done it again. If El-P produces my LP, I will only rap on 1 song, it will be called 'The Worst Rap Song Ever'... 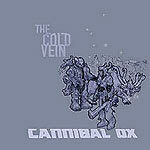 The Whole Cannibal Ox Record is a winner. WINNER! All Lyrics by Vast Air, & Vordul. All Songs Produced by El-Producto.